Gelato is Italian ice cream. While in composition it is not that different from other frozen treats, there are a couple of things that set it apart from a standard ice cream. First, it is generally made with more milk milk than heavy cream. Some recipes use all milk, as this one does, and others use just a touch of cream. I’ve had many shopkeepers try to impress this upon me as a selling point, since it makes the gelato lower in fat than ice cream is (for the record, it does work as a selling point because it gives you permission to eat extra). Second, gelato tends to be more dense than ice cream, with less air churned into it and fewer tiny ice crystals suspended in the mixture. This gives it a rich taste and texture even though it is made with more milk than cream. The final thing that sets it apart is that gelatos usually tend to have much stronger flavors than other ice creams. I won’t go so far as to say that this is a standard feature of gelato, but in my experience, it tends to be true. It is certainly true of this chocolate gelato. The recipe is from Bittersweet by Alice Medrich. 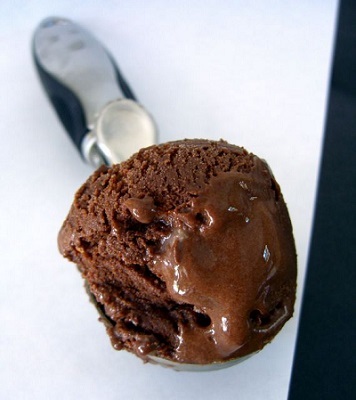 While many chocolate gelato recipes call for melted chocolate, this one only uses cocoa powder to chocolatiness. The gelato is very smooth and very, very chocolaty. You can probably only eat a small amount at a time. I added to the chocolate – not that the incredibly rich flavor needed it – with some chopped chocolate. I opted to go for the varying sizes of chocolate chunks (and shavings) instead of chocolate chips because I thought they would blend better into the gelato. I used a chocolate chipper, which looks like a tiny pitchfork, to get the job done, but your can use a sharp knife to shave off pieces of chocolate. In medium saucepan, bring 2 cups of the milk just to a simmer, which is when you start to see steam rising from the pan. In a medium bowl, whisk the remaining cup of (cold/room temperature) milk with the sugar, cocoa, and cornstarch. Once the milk in the saucepan has come to a simmer, add in the cocoa mixture. Cook, stirring constantly, until the mixture comes to a boil and begins to thicken. Cook for one more minute, then remove from heat. Strain mixture into a large bowl, cover the surface with plastic wrap, and chill until cold. Overnight chilling is best. Pour into your ice cream maker and churn according to manufacturers directions. Freeze until firm, at least 30 minutes, before serving. Stir in the chocolate chunks/shavings after churning or stir them in halfway through the churning process. Note: You can use any type of milk for this recipe, from skim to whole. I recommed going with low fat (1 or 2%), since it produces a creamy product and one that is lower in fat than one made with whole milk. Dangnammit, that sounds so dangerously good! I second that. Your gelato looks devilishly delicious. Interesting. Two weeks ago, I made the Gelato #2 recipe from http://www.travelerslunchbox.com/journal/2005/7/6/chocolate-vs-chocolate-the-ultimate-showdown.html and it was fabulous. It contains egg yolks though, so it will have more fat. The recipe also calls for straining the mixture. I found this to be helpful, since I found some clumps of cocoa powder, dispite my best efforts to eliminate them all. It makes a very smooth gelato. Yowza, that looks good (especially in this record-heat summer in LA)! This looks so good that I’d like to make it this weekend. At what point did you add the chocolate chunks? I really need to buy an ice cream maker, just to make my own gelato. There is a place close to my house that claims to sell “gelato”, it is nothing remotely close to the real thing. Your recipe sounds great and once I get a maker I’ll give it a whirl. i do love gelato much more than ice cream. we made some ice cream last week and it was quite rich and i wondered outloud whether it was possible to make gelato….and here you are! you are my hero! just out of the topic, do u have a recipe for chocolate mayonnaise cake? This look soooooo good!! I made chocolate gelato the other day, but most of the chocolatiness came from melted chocolate instead of cocoa. Maybe I will try this one over the weekend! Yumm!! really interesting post! i always thought that gelato contained more milkfat that icecream because it’s so much creamier…good to know! i’ll be eating gelato exclusively from now on =)yum! Nic, I made this gelato today and have just one word to describe it: PERFECT! One of the best and creamiest chocolate desserts I had lately. I love, love chocolate and this is absolutely divine, rich and smooth, so good! Thank you imensely for sharing the recipe with us! Hi Nic, it is me again… I really, really loved this gelato, it was the very best chocolate ice cream I have made. I even checked out the book from the library and loved it too! Since I liked it so much I would like to post it in my cooking blog too (kitchenspace.blogspot.com), would it be ok with you? And don’t worry I am certainly going to link you as the inspiration for trying the recipe! Really, thanks again for sharing this, it was trully delicious! yum! i made this gelato, used 1/2 buttermilk, 1/2 skim milk, 1/2 splenda, 1/2 sugar. i used cheesecloth to strain it – what do others use?? instead of doing the shavings, I had a lot of mixins available for people to do on their own. it was FAN-tastic – and all my girlfriends loved it as well. thanks! I will be giving this a whirl soon sounds lovely. Well I have made it and it did not disappoint thanks. Had some in a store today, I’m looking forward to trying my hand at making my own! I love gelato, I havent found a shop in my small town in S.C that makes it so I have to make it myself when I get a craving. I appreciate all of the recipes I can get my hands on. This sounds great! I do have a question. If I use a traditional ice cream freezer, how does less air get whipped in than for regular ice cream made in the same freezer? Do you recommend any certain ice cream maker or technique? It looks very tasty especially gelato with strong chocolate flavour. I have never tried gelato before but from your post I’m guessing once I eat I will never be able to stop. Very strong of cocoa, but I think that is what made it so great! I forgot to add the chocolate chunks, but it was still amazing. Thanks for the recipe- it will definitely be used again!